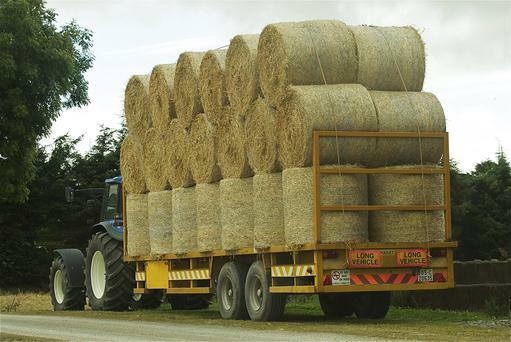 ESB Networks has issued a public safety warning to the farming community about transporting high loads of hay and straw which may come in contact with overhead electricity wires. Coming in contact with overhead electricity wires is extremely dangerous and can be fatal. Electricity wires are erected at best international heights that permit the transit of loads safely. However serious problems arise when loads are too high and interfere with live overhead electricity wires. ESB Networks Public Safety Manager Arthur Byrne says at this busy time for farmers, hay and straw is being saved and transported on roads around the country. ESB Networks is concerned about a number of incidents where tractors pulling high loads of hay and straw, have come in contact with the overhead electricity network. “When loading hay and straw onto a tractor or lorry, our advice is to always ensure that the load is low enough to allow for safe transit, and avoid putting the public at risk. “When planning the route with a high load, identify where electricity wires cross the road. Where there is doubt, establish if there is adequate clearance and, if necessary contact ESB Networks,” he said.